Car parking charges could rise next year in Guildford and concessionary bus pass holders will have to start paying to use the town’s park and ride services. Farnham Road, York Road, Guildford Park, Shalford Park and Walnut Tree Close car parks have been recommended for a pay hike in an attempt to get more motorists using the park and ride. However, on Wednesday November 26, it was agreed that people with a bus pass will now have to start paying £1 to use the park and ride. 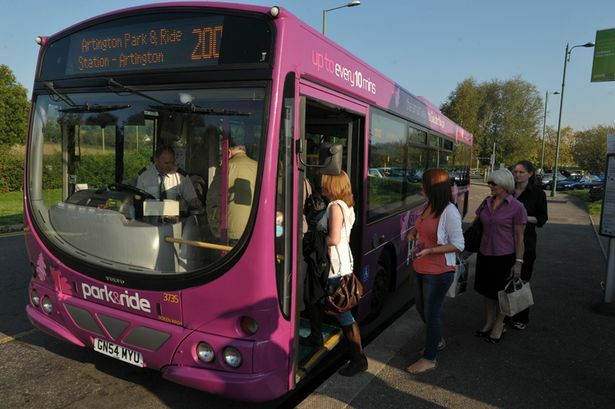 Kevin McKee, parking services manager at Guildford Borough Council, said that 45% of those who use all four of the park and ride services in Guildford, at Artington, Spectrum, Merrow and Onslow, are using a bus pass. “Concessionary bus passes were set up to encourage people to use buses rather than cars,” he said. “Obviously, with park and ride, people are using cars to get to the park and ride. An adult day return ticket for Onslow is £1.50, for Merrow is £1.80, for Artington is £2.20 and Spectrum is £2.40. In particular at Merrow, which has 335 spaces, more than half of the 245,626 passengers, 56%, who used the service from September 13 to August 14, rode on the bus for free. At Onslow Park and Ride, which has 550 spaces, from October 2013 to June 2013, 9,532 of the 32,127 passengers used a bus pass. Criticism has been directed towards the car park, which was opened last year, that it is underused, particularly by the Royal Surrey and University of Surrey, which want to make use of the space to alleviate their own parking problems. A lack of suitable signage directing motorists to the park and ride has been partly blamed for the empty bays. Recommendations have been made that Farnham Road and York Road mutli-storey car parking rates rise from 90p per hour to £1 per hour. At Guildford Park car park, the rise has been suggested from £4.50 per visit on Monday to Fridays to £5 per visit. Shalford Car Park could rise from £2.90 a visit to £3.20, and Walnut Tree Close car park from £3 to £3.20. Season tickets at York Road and Farnham Road, which cost £1,712.35, have been suggested to rise by 5%. A 5% rise from the £640 people pay to use garages in Guildford has also been recommended. It is hoped that by steering people away from town centre car parks and encouraging use of the park and ride services will improve some of the congestion that leads to recurring traffic jams in Guildford. The council is also looking to build car parks on the outskirts of the town to relieve the gyratory. Guildford’s Local Committee approved the new concession rate at the park and ride services. The increase is set to be determined by the borough council’s executive committee.